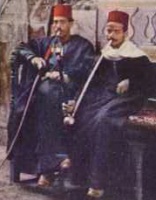 Egypt had a range of traditional costumes. 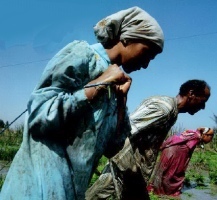 The farmers (fellahin) basically wear gallibayas. In the cities the upper classes adopted the clothes of their conquerors - Ottoman Turks from 1500s, and later European from 1798. To the south the Nubians have their own distinctive costume and across the desert the Bedouin also have a separate style of clothing. Peasant women would wear a gallebaya outdoors but in the city gallibaya tended to be worn only indoors. 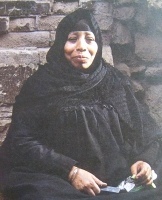 For public wear a woman would wear a wide woman's dress called a tob sebleh. Wide trousers were worn as underclothing (tshalvar or shintijan) gathered below knee and falling to ankles. The woman's kaftan was called a yelek. This was lined, with the neck open to breast and buttoned or laced along side seams for shaping. It had high side slit over trousers. Girded with shawl. Women would wear a shirt under the yelek, and a djubbeh or binnish over it. In Alexandria and Cairo, women would also wear the melaya luf - a large rectangular wrap worn for modesty, warmth, and used to carry things. 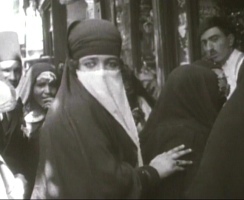 City women often worn a bur`a - a long rectangular face veil either of white cotton or open weave - and a headscarf (sometimes over a skullcap - taqiyah). 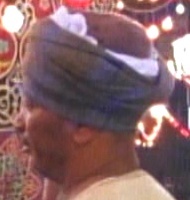 Another headcovering was the mandil (headscarf) sometimes decorated with pom poms. Among the fellahin a bag like hattah was sometimes worn. 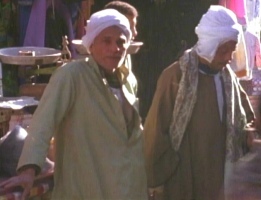 The basic traditional Egyptian garment for men is a long shirt (gallibaya). Tilke also distinguishes one with a looser fit under the arms (eri) and very wide version of the gallibaya called a kamis which was worn by fellahin. 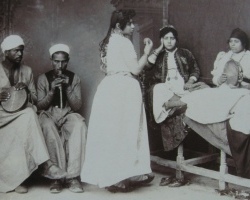 While working fellahin would hitch up the skirt of the gallebaya and wrap it around their thighs. Trousers (sserual) were sometimes worn under the gallebaya. Over the gallebaya a kaftan (often striped) was worn. A kaftan is a full length garment like a coat with long wide sleeves open in front and often bound by a fabric belt (hizan). Over the kaftan was a binish - a cloth overcoat with wide sleeves - often slit below usually dark grey and unlined. Alternatively, a djubbeh which had was more complex cut than the binish could be worn especially by Turks during the Ottoman occupation. The `ulama also wore a jubbah over stripped kaftan. The jubbah was a long, wide sleeved gown which reached to feet and was buttoned half way down. However, from the 1800s European dress replaced traditional dress among the Ottoman court and this was taken up by members of the elite. Therefore, senior civil servants and members of the ruling intelligentsia could be seen in Egypt in European style clothing. What was not worn by Egyptians was the Arab kufeya and `igal - except possibly among some Bedouin. Nubia straddles the south of Egypt and the North of the Sudan. After the building of the Aswan dam many Nubians were relocated in Aswan. Nubians belong to five main tribes - two of which (Kanuz and Fadija) are in Egypt. The Kanuz people are the northernmost. The Kanuz women wear dresses formed by horizontal lengths of fabric each of which is longer than the one above giving a dress with almost a flounce at the bottom. For special occasions - such as weddings a semi-transparent layer is added over the dress. Fadija women wear a wrapped garment a little like a sari. Men wear trousers, shirts, vests and turbans.